We can make any occasion special with flowers. We always have a large variety of seasonal flowers on hand and if we don't have them in stock we can get them for you and deliver them when requested. We also carry a range of novelty flower or plant containers for that special occasion. The Teleflora Smiley Mug, Red Wagon, Just Ducky, Red Fire Engine, and Hot Rod are just a few that are available. Arrangements in different size vases and baskets are always popular. If you just want to send that special treat of cut flowers, we can wrap a colorful assortment of fresh flowers to fill your own special container at home. A tasteful way to show you care. Six exquisite roses are arranged just right for that someone special. 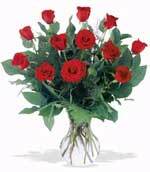 Choose from red, white, pink or yellow roses. Tickle her heart with this flirtatious mix of romantic roses and other flowers arranged in our elegant Silver Reflections vase. A special surprise on any day of the year, this is a vase she's sure to hold on to and it'll always remind her of you. Oh, what a fine day it will be when you have this delightful bouquet delivered to someone special. Everyone will delight in the vibrant colors and bountiful blossoms, all thoughtfully arranged in a beautiful leaf-lined vase. A whitewashed basket overflows with a few stems of pink spray roses and white daisies with complimentary fillers and greens. Just another way to show you care. Pink and Burgundy Clear Vase. A stunning, cheerful, elegant vase of fresh flowers to brighten someone's day.